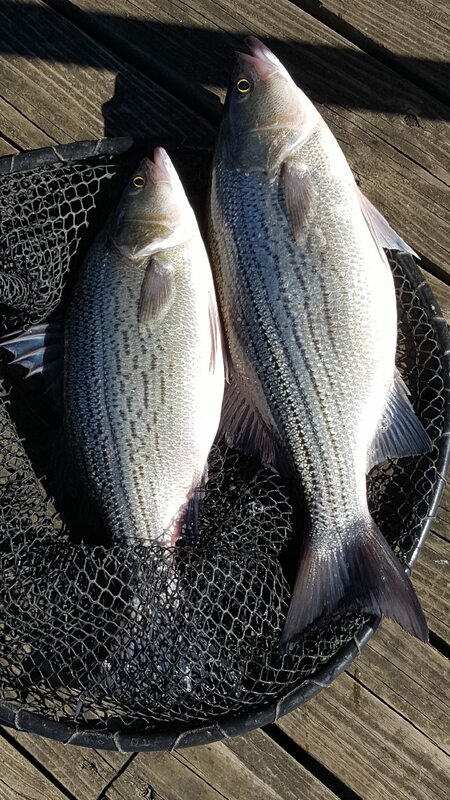 Norfork Lake striped bass, hybrid bass and white bass are still in their fall pattern, but you can see signs of the bait and fish starting to transition to their normal winter patterns and locations. As the water cools the bait tends to move out to deeper water and gets to a depth typically 40 - 60 feet deep. As you can guess, the big predators move with the bait. 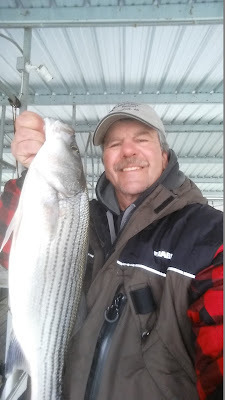 Over the last week I have concentrated on finding and trying to catch our trophy fish in Norfork Lake, striped bass. Normally this time of year I fish large flats in the lake in 35 - 50 feet of water. Cranfield Island flat, Mallard Point flat, 101 bridge flat, and Big Sandy Flat east of the 101 Boat Dock are my typical fishing holes. This year it has been a little different from prior years. 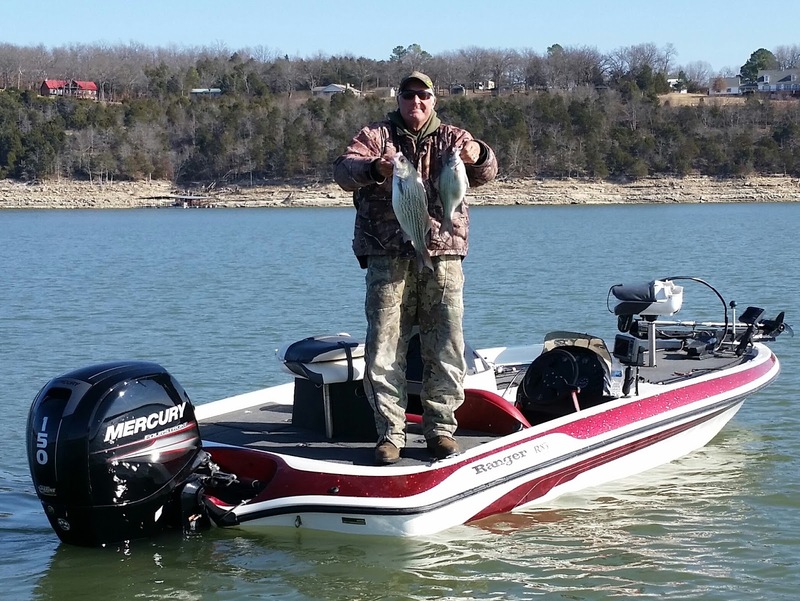 My guests and I have found large schools of striped and hybrid bass on these flats, but it has been hit or miss. If the bigger fish are not there you can just about be guaranteed that white bass will be on the flats. Some of the whites I have caught are in the 2 - 3 pound range. I moved around the last week and started fishing way up creek near 6B in Bennetts Bayou and found stripers were but they started to move out towards the main lake during the week. Large schools of stripers moved a couple of miles out of the creek to slightly warmer water and are located south and east of the 6A marker. in 35 - 50 feet of water. Yesterday (12/19) I decided to check out a creek in the mid lake area. The water gets a little warmer as you head south. I started fishing a little before sunrise and saw shad flipping. When I got closer to the bait a large school of fish showed up. 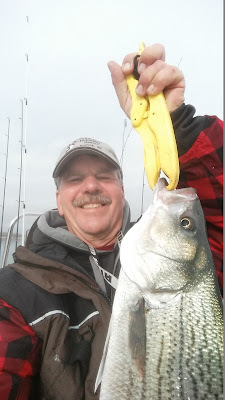 I had 2 live bait poles out with threadfin shad and was vertical jigging with a spoon. I hooked up on all three rods at the same time. What a fun dilemma! My fish on the spoon came unhooked and one of the live bait poles broke off, but I did manage to land a really big hybrid. I could see the bait starting to move out of the cove so I followed. I ran into the school again and landed a couple more hybrids and a couple of whites. The fish continued to move out and I found them one more time. It was a lot of fun for an hour or so. After that I moved out to the main part of Float Creek and marked bait with scattered bigger fish and got plenty of bites on my live bait, but they would only take the back half of my baits so no hook ups after the early morning schools of feeding fish. A friend was trolling in the same area and the fish were loving it. He had one hook up after another, it was fun watching. The scattered fish were suspended about 10 - 20 feet down, but as the morning wore on I was marking them close to the bottom around 35 - 40 feet deep. Norfork Lake water level is falling slowing with sporadic power generation and currently sits at 549.84 feet above sea level. The lake surface water temperature ranges from 52.5 degrees to 54.5 degrees depending what part of the lake. The water is still stained with the main lake having about a 5 - 6 feet visibility. Great fishing conditions on Norfork Lake at this time. Hummingbird Hideaway Resort's annual fishing derby has come to a close with a lot of fun for our guests during the year. The winners of each species won $350. The winner of the big striped bass was John James of IL, big crappie winner was Joe Cebula of KS and the big smallmouth bass was won by Debbie Biesboer of IL. The winner of the free week stay drawing was Karen and Dan Solverson of WI. Congratulations to all. Details about our 2018 Derby will be coming in the new year.